In our practice, we see companies struggle with the effective realization of their business strategy. In many instances business strategy is only seen as an inspiration document, disconnected from day-to-day business challenges and activities. This is especially true for innovation. Few businesses succeed in using their business strategy as a guiding framework, orchestrating all development activities from exploring opportunities, growing through adjacencies to innovating core products. and how to do that (advantages like technology, assets, competencies). Organizations that define a specific innovation strategy derived from the business strategy give further guidance in which areas to innovate (see the article by Iason Onassis: Innovation strategy – Demystifying the 5 things to address for more information on innovation strategy). However, a business or innovation strategy is mostly a direction and not a detailed description of what value propositions to develop. 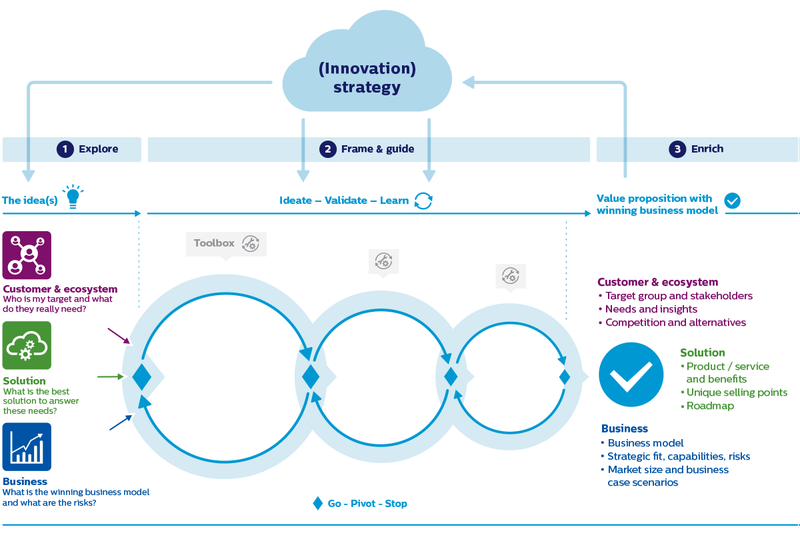 Our methodology to develop innovations with winning business models bridges this gap, by exploring in an iterative manner customer needs, different options to deliver a solution, and business model alternatives. An effective organization is able to direct all resources toward its strategic priorities. Developing innovations with winning business models is a good way to implement that, by ensuring that the business strategy is guiding, throughout the whole process. Starting with a project initiation document making a clear link between business strategy and innovation objectives, deliverables & KPIs. Additionally, throughout the whole process, there is a continued alignment between strategy and the development of the value proposition. When developing a value proposition, many questions will come up and several pivots might be needed until the proposition is validated. Is this a target group that we already know well or want to focus on? Can we deliver a better solution that our competition? Does it build on our competitive advantages or strategic enablers, like technology, assets, competencies, and brand? Does it match with our current roadmap and portfolio of innovation ideas? The development of a value proposition – and the launch of the innovation in the market – brings rich outside-in perspectives and learning. Teams will be confronted with new customer beliefs, new breakthrough technologies and emerging business opportunities. A good practice is to establish a structural feedback loop to collect and consolidate these learnings and use these input to update and enrich business strategy. Taking the case of a market leader in food processing. While testing new flavors with consumers, they noticed that bold flavors got the attraction. This observation was reported in value proposition projects. The observation helped the strategy team to detect the evolution of consumer taste (earlier than competition) and to build a competitive advantage around it. How to realize your strategy through value propositions? Translate your strategic direction into tangible offers (product, solutions & services), ready for development & launch. Guide the exploration and delivery of the strategic adjacencies. Establish a structured learning loop to further develop & enrich business strategy. Looking for business strategy development?